Students rewriting the history of South Africa on buildings and statues at the University of the Free State is an important act of restorative justice. In recent years, students in South Africa, Chile, Québec, and elsewhere, have been protesting neoliberal/neocolonial policies, including the outsourcing of workers on campus and significant hikes in tuition fees. In South Africa, protests by mostly Black students against tuition hikes took place under declarations that Fees Must Fall. Yet, students in South Africa are also protesting continued institutional racism, and even white supremacy, on university campuses and the continued colonization of higher education. Indeed, the Fees Must Fall movement is in some ways inspired by and a continuation of the Rhodes Must Fall movement that began in early 2015 and that was successful in demanding the removal of the statue of imperialist, racist, and mining magnate Cecil Rhodes at the University of Cape Town. These protests have taken place in the larger context of widespread disappointment that the promise of 1994 has not been realized, that little has changed in South Africa since the apartheid-era ended and the first democratic elections were held, and that what changes have been made have mostly been cosmetic. Racism, especially institutional racism, remains and few structural reforms have been carried out. At the University of the Free State (UFS) in Bloemfontein, a traditionally Afrikaner university in a traditionally Afrikaner and very conservative town and province (the Free State), Fees Must Fall protests were muted in 2015, at least in comparison to other universities. In February 2016, however, the workers’ strike against outsourcing and un-liveable, low wages, which many Black students activists participated in in solidarity with the workers, morphed into protests about just those underlying issues that Fees Must Fall was about — institutional racism and a lack of transformation at the university. 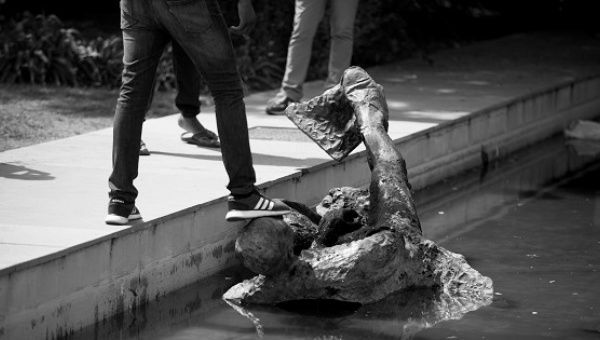 In their protests, Black students at the UFS also sought to transform the space of the university by renaming buildings after anti-apartheid activists and pulling down statues honoring Afrikaners who had been instrumental in laying the foundations of apartheid, which the U.N. recognized as a crime against humanity in 1973. Students pulled down a statue of Charles Robberts Swart, after whom the Law School used to be named and whose name still graces its auditorium. They tossed the statue into the nearby fountain, and set their sights on the imposing statue of Martinus Theunis Steyn located in front of the campus’ Main Building. CR Swart was an Afrikaner politician and member of the National Party (NP). He served as the Minister of Justice and then as the Republic of South Africa’s first State President, a ceremonial post in the 1960s. Steyn was President of the Orange Free State (now the Free State) at the time of the Anglo-Boer War and was one of the founders of the NP. The NP ruled from 1948 to 1994; its members are the key architects of apartheid. Students activists also renamed the Law School after anti-apartheid leader Robert Mangaliso Sobukwe. Sobukwe was arrested in 1960 for protesting the pass laws that made it illegal for Blacks over 16 years of age to be in white areas without permission from their white employers. Sobukwe was sentenced to three years in prison. The General Law Amendment Act, passed by Parliament in 1963, contained the so-called “Sobukwe clause,” which allowed those like Sobukwe who had already been convicted of political crimes to be imprisoned 12 additional months without the necessity of a trial. Thanks to this law, Sobukwe spent a further six years in prison before being banned to Kimberley in the Northern Cape, where officials felt he would be unable to be politically active. This is who student activists choose to honor, instead of Swart. Students also renamed residences after Winnie Mandela and Lillian Ngoyi. They painted Steve Biko’s name on the Steyn statue and renamed the library after him. 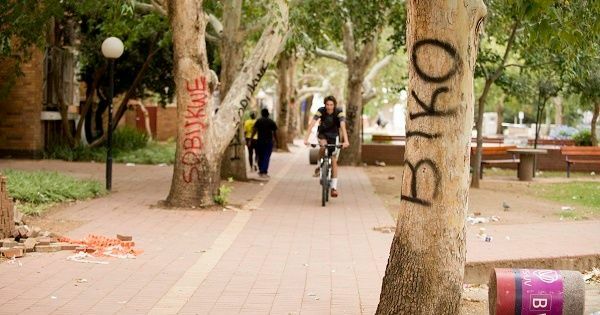 They named trees after Biko, Sobukwe, Chris Hani, Winnie Mandela, Marcus Garvey, Malcolm X, and various leaders of anti-colonial struggles across Africa. University officials labeled these actions vandalism, meaning that those involved were simply common criminals with no motivation behind their actions except, perhaps, some kind of pathological love of crime. Yet students’ graffiti can be seen from a different perspective. In South Africa and around the world, graffiti, or street art, is an invitation to have a conversation about the issues the graffiti artists view as important. In this case, the conversation is at least in part about history, and about whose history is present and can be read on buildings and statues around campus. Scholars who study place names through a critical lens argue that the official renaming of features of the cityscape announces the presence of a new regime in power and the dominance of a new version of history than the one that had previously been celebrated and seen as official. This is especially true in post-colonial or transitional societies (like South Africa in the 1990s). University officials’ erasure of graffiti points to their unwillingness to have this conversation about history, or at least their unwillingness to have it on students’ terms. 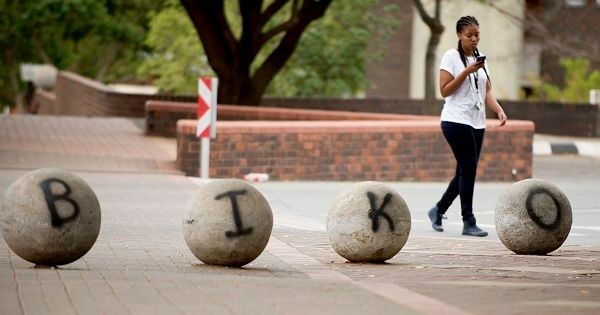 At the UFS, little official renaming has taken place despite an official recognition that it is a necessary element of the university’s transformation from an Afrikaner university that perpetuated racism to an inclusive and even non-racial university. So student activists, frustrated by the snail’s pace of officialdom, took matters into their own hands to speed up the process. Their actions indicate that they reject not only continued racism on campus, but also a version of history that honors the intellectual authors of apartheid, this crime against humanity, and the violations that occurred during decades of NP rule. They reject this history in favor of one that honors those who opposed it, many of whom did not survive the apartheid state’s brutal efforts to remain in power. More than simply being an indication of a new regime in power with its own history to promote, rewriting the history of South Africa on buildings and in the statues scattered across campus is an important act of restorative justice. It dignifies the victims of apartheid and their struggle against a racist, repressive, and violent regime. It helps to increase knowledge about that crime and the devastating effects it had on individuals, communities, and the nation. Though the university administration agreed to meet workers demands for insourcing and a more livable wage in the coming years, the graffiti and the history it represents have since been erased. Restorative justice has been undone. It remains to be seen when it might be restored.